If you're short on time but still want to see the Grand Canyon, this express helicopter is the perfect option. Departing from the Las Vegas strip, this tour flies you through the Grand Canyon, Hoover Dam, Lake Mead, beautiful Lake Las Vegas and Fortification Hill, an extinct volcano. On your return, fly over Downtown Las Vegas and the Las Vegas Strip. 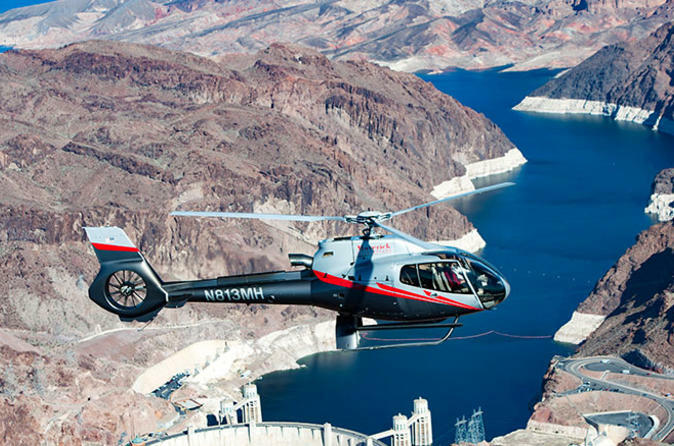 Perfect for the time-conscious traveler, this tour allows you to see the incredible canyon from above as you enjoy a breathtaking 45-minute helicopter ride from Las Vegas. You'll fly over nearby sights like the Hoover Dam, Lake Mead and Colorado River on the way. With multiple flight times throughout the day, you'll be picked up at your Las Vegas hotel based on the time selected and taken to the heliport to check in for your flight. Then board your state-of-the art EC-130 helicopter and take off for the short flight to the Grand Canyon. As you fly over the canyon-strewn landscape you'll pass over sights such as the Hoover Dam, the Colorado River, Lake Mead and several extinct volcanoes heading to your final destination.Your pilot will provide fact-filled, captivating narration about the sights you see along the way. Finally, you’ll arrive at the West Rim of the Grand Canyon where you'll journey for 40 miles (64 km) over the picture-worthy canyon, snapping a few aerial photos as you fly. Along the way back towards Las Vegas, you'll take one more sky-high pass above the famous Strip before landing at the heliport.